The pier pin sections, comprises of two pieces, one the base plate with a solid pin protruding upwards. The second piece, is a one and a half meter tower section tapered to a point, with a thick plate, with a hole to mate with the base pin. The concept is that any miss alignment or twisting moment of the tower freely pivots around the horizontal axes. This prevents bending of the legs and eventual failure, if the tower were set into solid concrete. 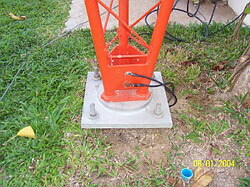 The tower weight is supported by four, one inch bolts, with large nuts and washers either side. The plate if required can be heightened or lowered, as there is a 3 or 4 inch air gap beneath. 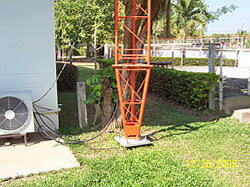 Two black 10mm earth cables can be seen, bolted to the tower, one is from a substantial ground system, and the other is to the stations earth. 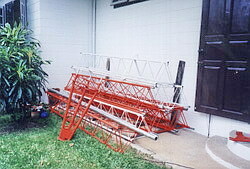 These are the new tower sections manufactured in Bangkok. They arrived completely galvanized and painted in red and white sections. There was no problems with miss aligned tower legs fitting together. I temporary hosted three section, to test the antenna etc, all came to pieces nicely. Each section is bolted together with a half inch nut and bolt, also galvanized. One problem I did have, was that I requested fabrication of a rotator base plate, to be mounted inside the tower section. I had purchased the top thrust bearing but due to several factors, could not align the stub pole, so that it rotated freely. After several attempts, I discarded this idea and welded to the top plate a half meter stub mast. I then mounted the rotator on top of that. I kept the length above the rotator short to prevent overloading the rotator bearings.